Looking for Planning FAQ’s? Click here. 1. What does AONB stand for and what does this designation mean? For full details of what Area of Outstanding Natural Beauty (AONB) designation means please go to our Caring page. The earliest known form is Mendepe in 1185 – possibly medieval term “Myne-deepes”. Or could be from Celtic monith, meaning mountain or hill. Or perhaps Old English yppe in the sense of upland, or plateau. Or Mened (Welshmynydd), a Brythonic term for upland moorland. Or ‘the stone pit’ from the Celtic meyn and dyppa in reference to the collapsed cave systems of Cheddar. Or Basque word ‘mendi’ meaning mountain. A later reference of A.D.1234 in their records talks of “common pasture of Menedep for one thousand sheep”  (note the loss of the final “e”). Various suggestions have been made in the past as to the earlier origins of Menedepe or Menedep. This might have come from the Celtic “monith”, meaning mountain or hill, or the Old English “yppe” meaning upland, or plateau. Either would explain why locally Mendip is known by many as “ the hill”. Hunting in the Royal Mendip Forest had gone on since at least the time of King Edgar, son of Alfred the Great, which is why the name “Mendip Forest” still persists on early maps. From the Middle Ages until recent times all published accounts talk of “Mendip” or “ the Mendip Hills”, for example, Billingsley (1797) and Acklund and Sturge (1851). The contraction of this to “the Mendips” seems to have been first used by geologists notably Reynolds ,  soon followed by Welch . Of the standard Mendip textbooks past and present six use the term “Mendip”, (Compton (1893), Gough (1930) Balch (1941) Atthill (1971) Atthill et al (1976). Reid (1979) while that by Coyshe et al (1954), uses “Mendips”. Two books are inconsistent, being compilations from various authors, those published by the Bristol Natural History Society  and the Mendip Society . (Oxford. Record. Society. ), no. 247. Thanks to Chris Stephens, for the research. 3. Why were the Mendip Hills designated as an Area of Outstanding Natural Beauty? Please go to Special Qualities. 4. How is the AONB funded? DEFRA funds up to 75% of core costs (salaries, accommodation etc) and our five partner local authorities pay a proportion of the rest. The local authorities also contribute to the AONB budget for projects. Then we bid for other money to carry out more projects. More detail can be found in the Annual Review. 5. How much of the AONB falls in each local authority area? Somerset County Council encompasses Mendip and Sedgemoor Councils. 6. What powers does the Mendip Hills AONB Partnership have? None, it is an advisory committee. Individually the local authorities and government agencies such as Natural England and English Heritage have powers through planning and other legislation to protect the AONB landscape and aspects of designated features within it. Go to AONB Partnership pages and find out more. 7. Is my house within the AONB Boundary? 8. Where can I get information about projects funded by the AONB? If you want to read about recent and current projects go to our Mendip Hills Fund page and Our Work page or contact us on 01761 462338 or via email Mendip Hills AONB. 9. 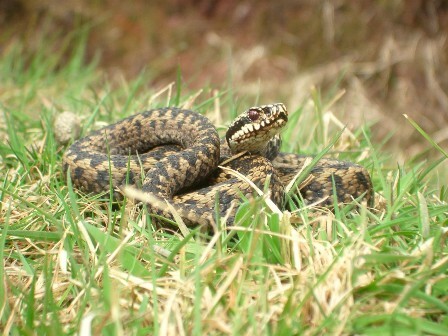 What do adders look like? Grey-brown body with zigzag markings down the back. 50 to 60 cms in length. Found usually on heathlands, moorlands, and gruffly ground, usually from March to May. The weather on the Mendip Hills is extremely changeable. We advise people to dress for all eventualities, especially in the Winter months. Before you visit the hills you may wish to check the weather on the BBC and have a look on Mendip Weather. 11. What walks are there in the area? Go to our Walks page for full details and information. 12. Which OS maps cover the area? 13. What is the geology of the AONB? 14. Deer Collisions – What happens next? If you find an injured wild animal, watch it first to see how badly hurt it is. Then contact us (the RSPCA) on 0300 1234 999, or take it to a nearby vet or wildlife rehabilitator. If possible, contain the animal before calling – see advice on RSPCA web site. 15. What should I do if I see someone fly-tipping? If you notice someone who appears to be fly-tipping – the illegal dumping of rubbish and waste materials – do not approach them, but try and record the registration number of their vehicle and report this along with the details to the relevant local authority. 16. What do I do about a blocked path, a broken stile or cattle in my path? Whilst walking, cycling or riding in the Mendip Hills AONB you may come across an issue on a Public Right of Way, such as a blocked path, broken stile, cattle grazing or prohibited access. If you come across an issue affecting a PROW or highway, make a note of the National Grid Reference and the specific problem and report it to the relevant local authority. Visit Website – using A-Z index, click through to P, find the Public Rights of Way pages and use the ‘Problem Report’ form. 17. How do I contact a Dog Warden? Sedgemoor District Council – 0845 408 2546. 18. Why do I need to clear up after my dog? 19. What should I do if I see any tree defects? 20. What should I do if I see any illegal activity occurring within the Mendip Hills AONB? If you see any illegal off-road driving or any other type of illegal or suspect incident in the AONB please ring the Police 101 telephone number immediately. 21. Ticks and Lyme Disease. A tick is a small blood sucking mite normally living off the blood of wild animals but occasionally attaching itself to humans. Most tick bites are harmless, but occasionally bacterium carried by some ticks can cause Lymes Disease, a serious illness. Click here for an information sheet on prevention and what to do if you have a tick bite. 22. What should I do if I want to organise an event in the Mendip Hills AONB? In recent years an increasing number of large-scale events have been taking place in the AONB. To try and ensure that such events do not have a negative impact on the environment and on other people’s enjoyment of the area the AONB Partnership has produced guidelines with the aim of ensuring that events within the AONB are appropriate, well planned, well located and well organised.